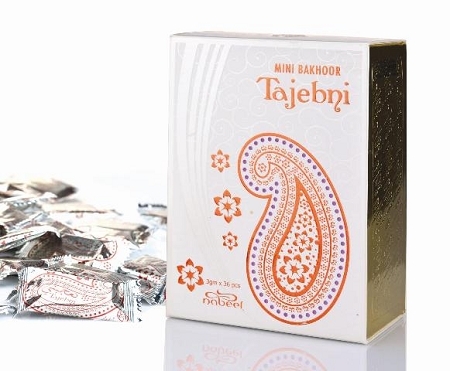 Box of 36 premium quality min-bakhoors (3g each) individual packaged like luxurious chocolates inside a beautiful golden, ornamental box. Give as gift to someone special or for your personal pleasure. 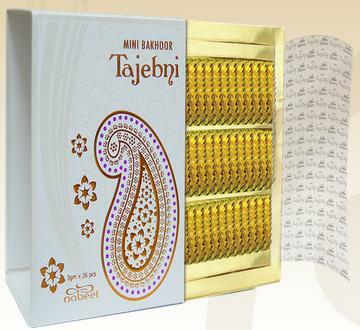 A beautiful smelling popular bakhoor, gentle to burn and slow to release Mini Bakhoor Tajebani. Top Notes : Saffron, Labdanum, Lemon. Middle Notes : Lavender, Nargamotha, Elemi. Base Notes : Sandalwood, Guaiacwood, Caramel. Olfactive Femilies : Aromatic - Woody.